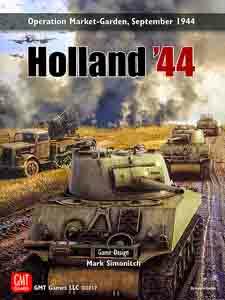 Holland '44 is a two-player game depicting the Allies' combined ground and airborne attack in the Netherlands during WWII, which was code named Operation Market-Garden. This daring plan to grab critical bridges across The Netherlands had the potential to open up a clear road into Germany. However, remnants of several battered German divisions were in the area and were able to slow the ground offensive and almost totally destroy the British 1st Airborne Division. The Allied Offensive was a failure. In this game, you have the opportunity to change history and study the campaign in detail. Did it have a chance of success? Could things have been done differently? You decide. Each turn represents approximately 8 hours. Most units are battalions, though there are many company-size German units depicted. The game uses the simple Move-Fight-Supply game system developed in Normandy '44 and Ardennes '44. Important elements like supply, troop quality, tank quality, artillery support, and command-and-control are all reflected in the game. Special rules for airborne landings, airborne supply, bridge destruction and repair are also included. The game covers the first critical seven days of the battle with a 20-turn Campaign Game and a 11-turn Tournament Scenario.